My outfit for today mixes together a lot of ingredients I love. I think it was a recipe for success! The first ingredient is rich, vibrant color. Second ingredient, lace. Last, but certainly not least, polka dots! Polka dots make any outfit amazing in my opinion. Last summer I decided I wanted to try the trend of brightly colored fitted pants. The pants I am wearing today are from Target. I actually prefer the fit of these pants to other retailers. In fact I liked them so much that I purchased them in a few different colors. 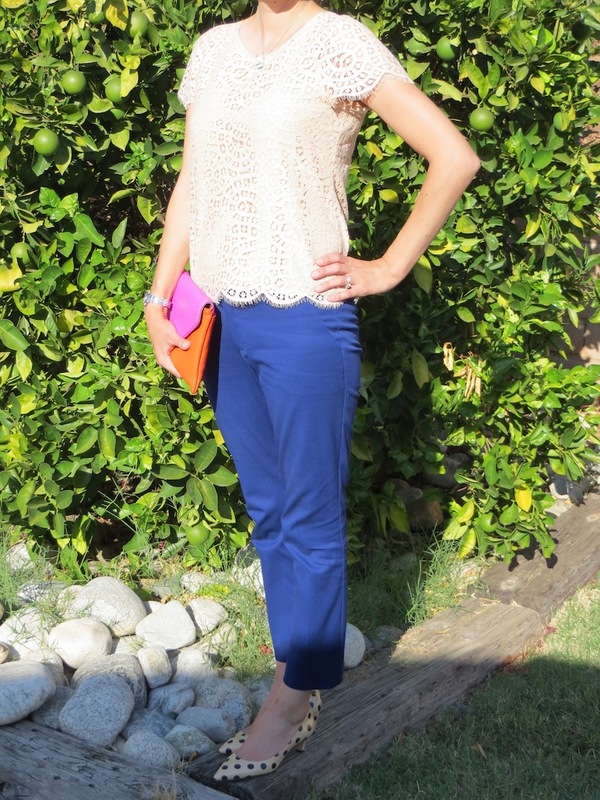 With all the bright colors going on in this ensemble, I thought it best to have a neutral top. The J. 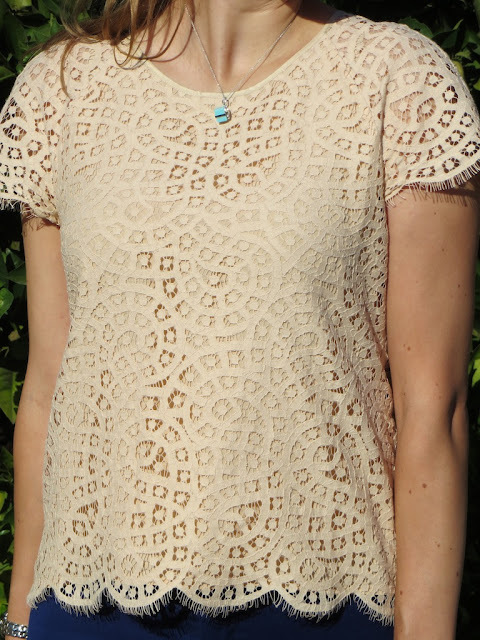 Crew Raindrop Lace top is a perfect neutral which goes with everything. I bought this in a size 0, because that was all they had in stock. It turns out that the size 0 was the perfect size. Lucky me! My favorite part of this outfit is what I consider to be the icing on top, the accessories! I am wearing the J. Crew Invitation clutch in color block orange/fuchsia. My shoes are the Kate Spade "Scene" with polka dots. The real reason I wore these shoes today, besides for the fact that I love them, is I wanted to make sure they fit and were comfy because I am going to order them in the black with cream dot pattern. In fact, I think I'll do that after I post this. Maybe that is crazy, but I think these are some seriously cute shoes. Plus, the low heel makes them a perfect option for work. Thank you Katherine! This is one of my favorite tops! the tee is one of my favourites. you look awesome. You're so sweet phiphi! These shoes run crazy big! I am normally a size 7-7.5, but I took a 6.5 in these. I read other reviews and most people agree to size 1/2 to one full size down. Despite the odd sizing, these shoes are pretty comfy. You should get them!